Dry corrosion occurs when there is no water or moisture to aid the corrosive process, and the metal oxidizes with the atmosphere alone. 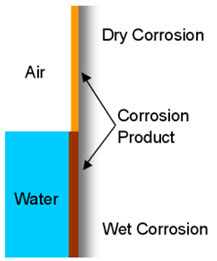 Wet corrosion of metals occurs through electron transfer, involving two processes, oxidation and reduction. In oxidation, the metal atoms lose electrons. The surrounding environment then gains the electrons in reduction. The metal, where electrons are lost, is called the anode. The other metal, liquid or gas which gains the electrons is called the cathode.